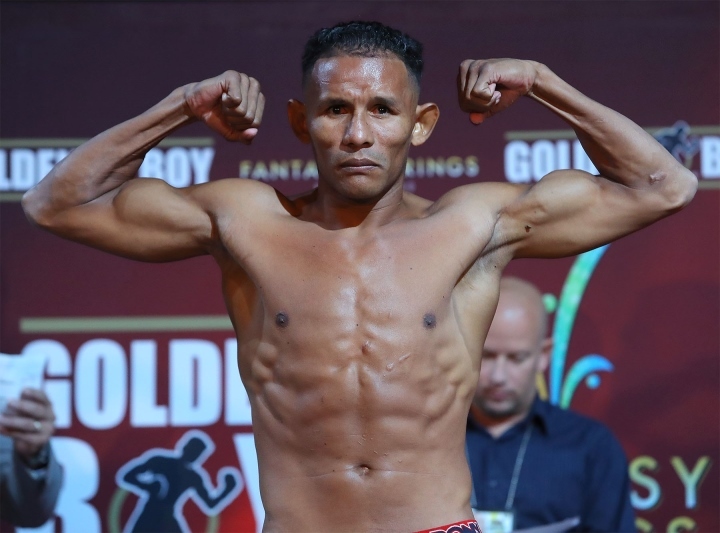 Fantasy Spring Casino, Indio, California - For the vacant WBA Fedelatin super lightweight title, a battle of southpaws saw Ismael Barroso (20-1-2, 19 KOs) knocked out Fidel Maldonado Jr. (24-4-1, 19 KOs) in the sixth round of their Golden Boy on ESPN televised main event. Maldonado has been undefeated in his last six fights, after getting stopped by Amir Imam in five rounds back in January of 2015. He fought last in June, when he won a close ten round split decision over Pablo Cesar Cano. Barroso was at one time a very feared force at the weight, with a crushing stoppage of Kevin Mitchell in December 2015. But in his last fight, all the way back in May 2016, he was stopped in seven rounds by WBA lightweight champion Anthony Crolla. Barroso started very fast and was busting Crolla up, and leading on all three of the scorecards - but he ran out of gas once the sixth round hit, and was knocked out by a bodyshot in the seventh. Barroso started very slow - unlike his last bout where he threw like 100 punches a round against Crolla. He was being accurate and landing good shots on Maldonado, who was boxing at his own pace and not taking chances early. Maldonado came out his jab in the second, looking to set up his right hand. Barroso was still taking his time and not being very active. There was a lot of clinching starting to take place. During the third, Maldonado was clipped and dropped by two hard left hands. Maldonado was very hurt, but managed to survive as Barroso tried to finish him off. At the start of the fourth, Maldonado was not fully recovered and was doing more holding than punching. He was doing so much holding that the referee called time to deduct a point. A big cut opened up under the right eye of Maldonado in the fifth round. He still appeared unsteady on his feet and Barroso did his work. In the sixth round, a series of punches, including a hard hook to the body, put Maldonado down for the full count. Barroso vs Indongo should happen in 2018. It will be brutal of a fight. Maybe it was the weight. Left his fight in the gym @135. 140 looks competitive without Bud. [QUOTE=TaurusJ27;18134024]Barroso is lethal as hell[/QUOTE] He has a lot of power in that left hand.